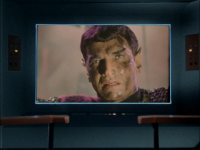 - This is the first episode to feature the iconic Romulan Empire and is easily the best episode of all of TOS. If you watch only one episode of Star Trek TOS, let it be this one. - This episode establishes that according to the science of the 23rd century in Star Trek, there are approximately three million Earth-like planets in the galaxy. - This episode is the winner of my "Best Episode of TOS Award" and is therefore a candidate for my "Best Episode Ever Award." - The wedding interrupted at the beginning. 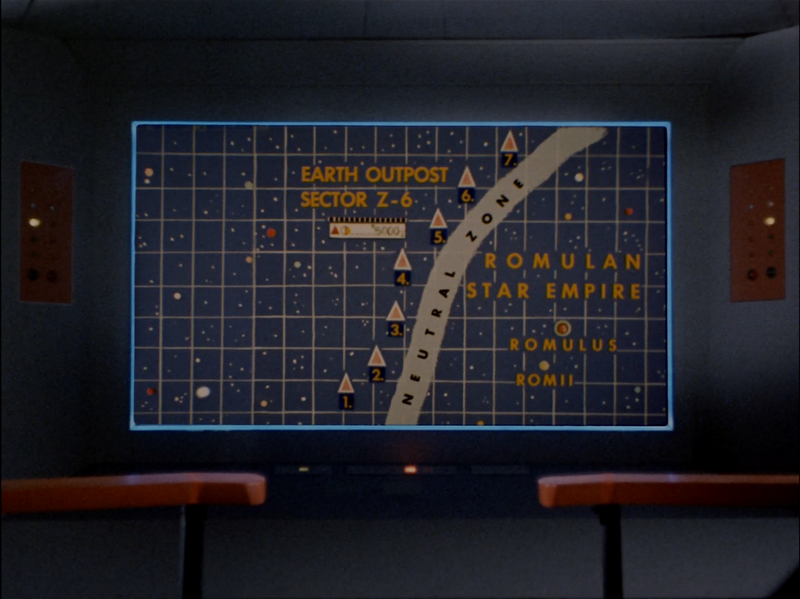 - Spock explaining the map of the Neutral Zone. - Stiles describing an ancester of his: a ship captain who died fighting Romulans during the Earth-Romulan war. - The Romulan ship destroying another Earth outpost before the Enterprise's eyes. - Kirk chastising Stiles for questioning Spock's loyalties. - The external closeup shot of the Romulan ship. - The Romulan commander: "Another war. Must it always be so? How many comrades have we lost in this way? Obedience. Duty. Death, and more death..."
- Spock: "I agree. Attack." I love that line because that was the last thing everyone was expecting him to stay given the newly discovered connection between the Romulans and the Vulcans. - The battle at the comet. - The Enterprise outrunning the plasma torpedo. - The Romulans evading the Enterprise by dumping debris and running. - McCoy: "In this galaxy there's a mathematical probability of three million Earth type planets. And in all of the universe, three million million galaxies like this. And in all of that, and perhaps more, only one of each of us." - The Romulans planting a nuclear warhead in the debris. - Spock dealing the finishing blow to the Romulan ship. - The Romulan commander's discussion with Kirk at the end. Meet: the Romulan Empire. This episode is quite clearly a 23rd century Cold War allegory in which Earth is the United States and the Romulan Empire is the Soviet Union. You might not think that to be a terribly original premise given how much fiction is out there satirizing the Cold War, but the devil is in the details which are strikingly original and fascinating in their implications. 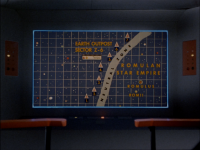 During this episode, Spock reveals that Earth fought an interstellar war with the Romulan Star Empire a hundred years ago during the 22nd century. This conflict ended with some kind of stalemate which resulted in a neutral, demilitarized zone of space created to serve as a buffer between the two nations. Since that time there has been absolutely no contact between them. As the title of the episode implies, such a political situation is a terrifying prospect. Imagine a powerful, reclusive nation sitting just on the other side of your border, ready to strike at any moment! The Romulan Empire chose this moment to strike. This episode doesn't go into the implications of what Earth's political response will be to this blatant attack on its sovereignty as there wasn't enough time, but given the seeming importance of the events of this episode there are without a doubt more stories to be told about the Romulans. Like the political conflict, the revelation that the Romulan species is genetically related to the Vulcans is intriguing, as are Spock's comments about his people's volatile past. The Romulan Empire can thus be seen as a road not taken by the Vulcans. The Romulans are what the Vulcans might have become like had they not embraced logic and emotional detachment at the core of their philosophy. Given that, it's understandable why Spock would urge so diligently to destroy the intruder as he has a deep understanding of the threat they represent. This level of conviction adds new dimensions to both Spock and his people while cultivating a deeper, more interesting and nuanced antagonist at the same time. 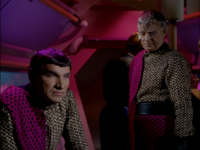 While the episode does an excellent job deepening the Romulans through Spock, the plotting also gives them a great deal of time to shine on their own. The frequent cuts to the bridge of the Romulan vessel were an excellent choice on a number of levels. On the surface we get the delightful opportunity to see a space battle from both sides. But moving beyond that simple pleasure, framing the story in this way allows us to get to know the antagonists personally. We get to see them in their element and in their context. In a certain sense the story treats both sides of the battle as protagonists. In this story the tragedy isn't the traditional, expected suffering of the good guys at the hands of the bad guys, the tragedy is the conflict itself. By cultivating Romulan characters who are deep, sympathetic, and nuanced, their deaths at the end of the story are as tragic as the death of the crewman who was to be wed. This is the sort of stuff the finest dramas are made of. This is without a doubt the best episode of Star Trek so far. I am with you on that estimation. Fine fine episode. Prime examle for an episode that tells a great story without even much of a plot or huge effects, just by picking, if you will, two great minds locked in combat. yay. I was much less enthusiastic about this episode, because frankly, much of the story sounded inconsistent, and even non-sensical, to me. The first thing that didn't make much sense was the description of the earth-romulan war, which supposedly was thought without either side seeing each other. Ahh??? This makes absolutely no sense. I can understand how in a specific battle which was fought with long-distance weapons the sides didn't see each other, but the whole war? And how was the ceasefire treaty signed without communication? And if communication was possible, wasn't it natural to also have visual communication? 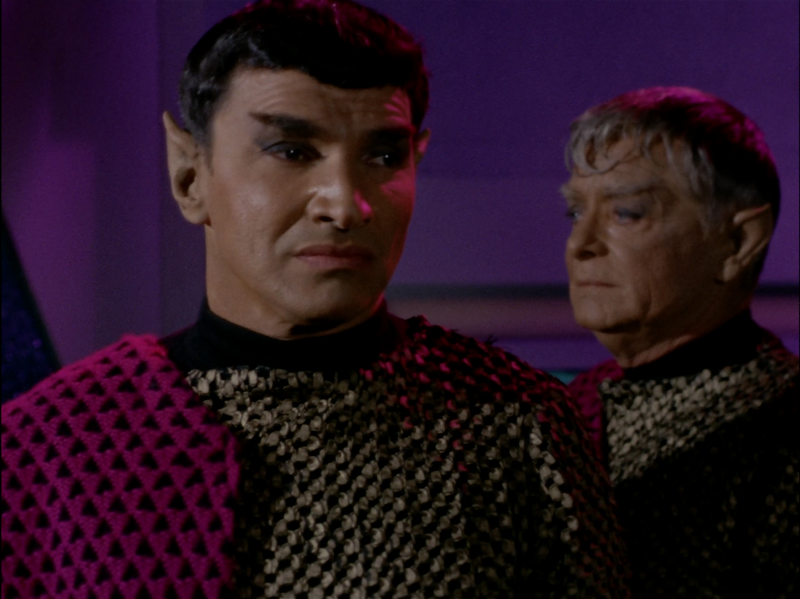 Also, didn't the Vulcans know who the Romulans are? I find this very strange, to say the least. The second thing is that indeed, the battle on this episodes feels like a submarine battle, without any reason. The plasma bomb the Romulans used is cool, but why not use a more conventional ship-to-ship weapon against the enterprise? Isn't it strange that Enterprise shot so many sucessful phaser shots against the invisible Rumulan ship, and the Romulans did not shoot more at the fully visible Enterprise? And isn't it strange that the Romulans have such advanced technology (like cloaking and that astroid-destroying weapon) but couldn't get the basic stuff (like a normal anti-ship weapon, and speed, for god's sake) right? The Earth/Romulan war being fought without either side seeing each other is entirely plausible. To see how that might have been accomplished, watch Ent: Minefield, Ent: Babel One, Ent: United, and Ent: The Aenar. 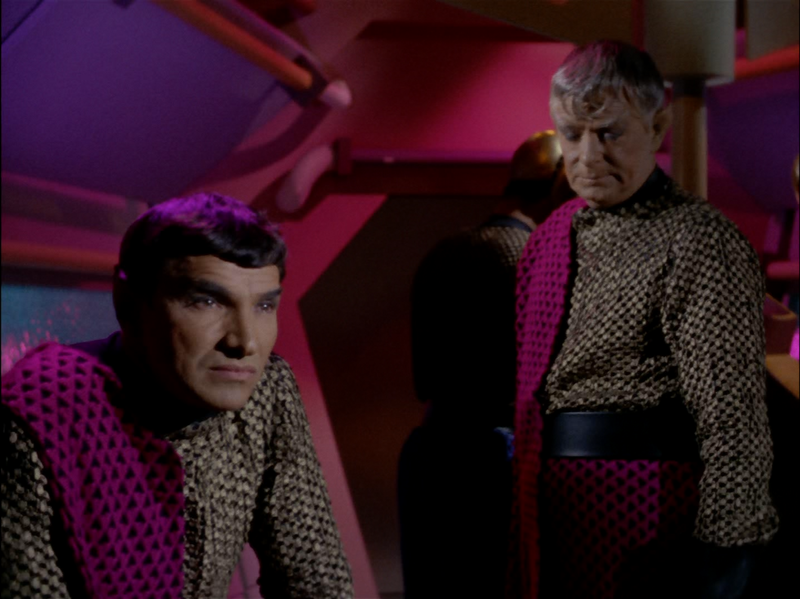 The recurring theme is that the Romulans did not want the Vulcans to discover their linked heritage. Moreover, there wasn't "no communication." There was plenty of audio communication. Again, the Romulans didn't want visual communications so as not to reveal to the Vulcans their linked heritage. Regarding the plasma bomb, it was obviously an experimental weapon. It's possible that other weapons had to be removed to equip their ship with it. It's like a submarine story because, like a sub, the Romulan can disappear from the sight of the Enterprise. Like a sub, the Romulan ship is slower, it relies on stealth not speed. Like a sub, it appears for a moment when it launches it's torpedo. If it misses, it has to try to evade the depth charges (phasers, although the episode mistakenly uses the photon torpedo visual effect, which is more like a depth charge in a way). The resemblance is intentional and, in my opinion, well done. I found this episode disapointing. For the most part, it's just Romulans shooting at our heroes and the heroes shooting back. More characterization and less shooting would've been better. The only interesting parts were Spock explaining why he thought the Enterprise should attack the Roumulans and the crew member who was rascist against Spock. The woman who almost got married was nice eye candy, though. Another factoid: the Romulan Commander is played by the wonderful Mark Lenard, who went on to play Sarek, Spock's father. This is definitely one of my favourite episodes, although I was slightly irritated by the antique-speak aboard the Romulan vessel; they sounded like they were quoting from a book. But despite that I still find it dramatic and entertaining, with plenty of stuff happening - I have to disagree with 411314, all the shooting was just background to the "will they/won't they/will they start a war" theme. Lots of little scenes to enjoy as well; my favourite is Spock completely destroying the soppy moment where Stiles thanks him for rescuing him. I totally agree with Kethinov that “The Balance of Terror” was indeed “the best episode of all of TOS.” And his review was very thought provoking and helped to deepen my understanding of the story. Excellent review! I would only add another comment about the significance of this episode. And that is the question of racial bigotry. The way it is dealt with in this episode is so great. I kind of wish more episodes had dealt with race relations in the future. I really think it is a little naïve of us to think racism will be non-existent in the future. Especially when you consider all the alien races we will encounter and how “earth men” will think of themselves as superior. The look on some of the Enterprise crew’s faces as they see Spock in a new light is priceless. I loved the doubt in their faces. It told a whole story without anyone saying a word. And more importantly, how Captain Kirk, the earth man, deals with the defeat of the Romulans, another race. Some aboard the Enterprise would have leveled the Romulan ship until it was completely destroyed ( hmmmmm does this remind you of Star Trek 2009? ). However, Captain Kirk doesn’t do this. Instead, He chooses to offer a helping hand to the Romulans. This demonstrated a part of Kirk’s strong character not always seen in later Star Trek episodes and movies. 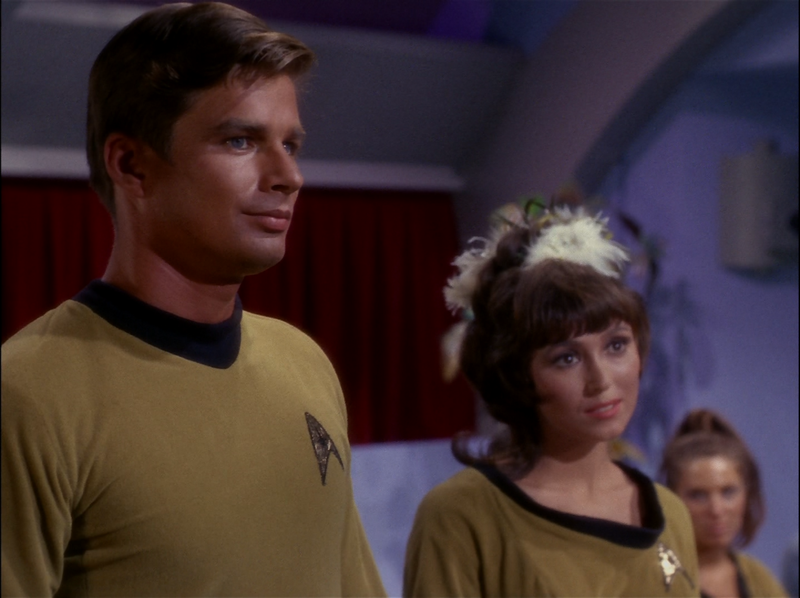 I always admired the ealier Kirk’s stance on the words “to seek out new life” and what those high sounding words really meant. And kudos on the acting of Mark Lenard! He really bought the Romulan character to life. I just had a couple of nipicks ( don’t I always? LOL ) on an otherwise perfect episode. I only noticed them after watching the episode for the 1,000th time. The first was when the Captain enters the chapel and Dr. McCoy says to Kirk, “Call for you from the bridge.” That seemed a little odd to me since the bridge can send out a page to the Captain thoughout the whole ship. Couldn’t the Captain have spoken to the bridge just before he entered the Chapel in the corridor? Also, when the Romulans enter the comet’s tail the Romulan Commander clearly says the comet’s “many particles will obscure their sensing device”. But a moment later he is surprised at the fact that the Enterprise is no longer showing on the Romulans sensing device. 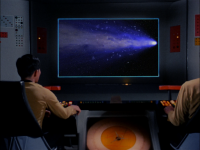 Wouldn’t the Romulans sensing device also be obscured by the comet’s many particles ? This episode well executed and is very engaging. The music goes very well with what we see. And it's fun to see each side debate, plan, execute their moves, etc. Also, just like "The Cage", there's a lot of stuff squeezed into the allotted 50 minutes -- that is, little or no filler. You never have to wait for something interesting to happen. How can we still see anything from Outpost 4 after it's been destroyed? Any cameras and transmitters would have been destroyed along with it. Yet we clearly see the Romulan ship, watch it vanish, this time with the stars moving -- all *after* the asteroid has been destroyed. Furthermore, how can the Enterprise crew have seen anything at all? I would think that the first plasma salvo would have destroyed any surface cameras and transmitters. Look what happened to the command post 1 mile deep! And some surface equipment is going to survive? I don't think so. A fun scene, even though it's not possible. Along a similar vein, why does the picture from the Romulan ship fade out when it blows up? Being an explosion -- nuclear, no less -- you'd think it would be an abrupt cutoff. So how can we have a fade-out and enough time for the Romulan commander to fall? 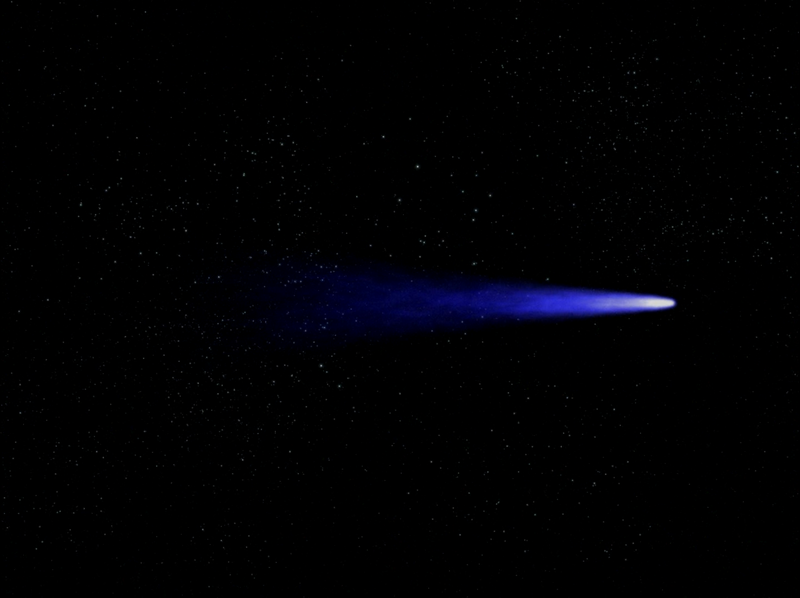 Comets don't have tails out in deep space. They have to be near a star. It looks pretty cool, though, and the music for it was well chosen. But why did they wait until they got out of the comet? Weren't they supposed to see the bird of prey in the comet? 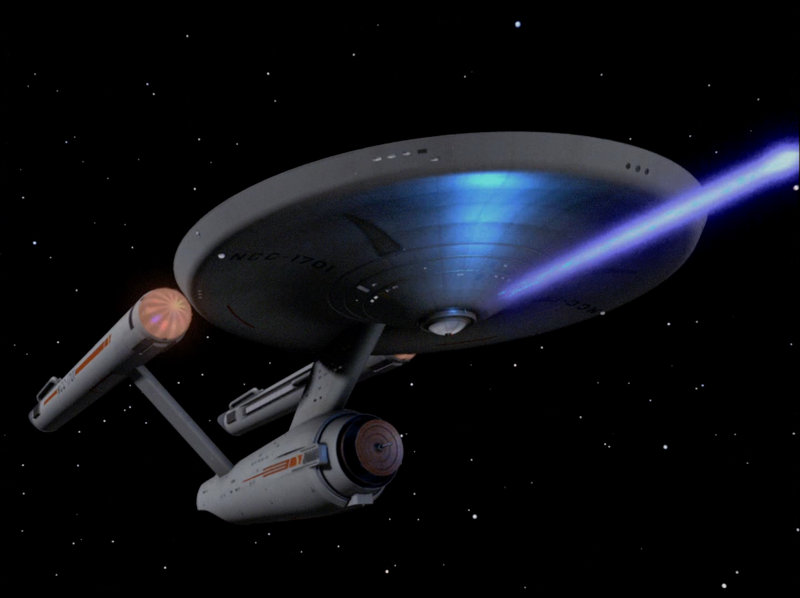 As to the cloaking device: What's lighting up the ships in the first place? Can they see the relatively tiny ships at fantastic distances lit up only by distant stars? I'm not sure it's possible to construct a telescope big enough, yet small enough to be on the Enterprise, that has sufficient light-gathering power and resolution. If so, why the need for the cloaking device? 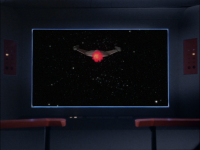 How did the Enterprise get a candid video of the Romulan bridge? Decius sent a message informing the "Praetor" of their "glorious mission" (in the other direction, no less) -- not a closeup of the Romulan commander in thought. It's worth going with this, though -- just to see the reactions on our heroes' faces. Don't the Romulans have phasers or the like? All they have is the cloaking device, impulse engines, the plasma weapon, and a really cramped bridge? Can't the Enterprise duck the incoming plasma ball? I guess the plasma ball is a heat-seeking weapon. Even so, it seems worth a try. Don't they have seat belts? 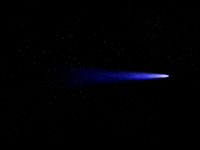 During the last battle, the Romulan ship becomes visible in order to fire its weapon. Kirk gives the order to fire, but the phasers are inoperable due to the coolant leak knocking out the operators. It takes a while for Spock to run down the hall and press a few buttons to save the day. What in blazes are the Romulans waiting for during all this? They had about 35 seconds to fire their weapon! I guess their weapon malfunctioned too. But if it did, it should have been shown. Why can't the phasers be fired from the bridge? In which case, why is the phaser "control circuit" located on the bridge? Speaking of phasers, they repeatedly fire the luckiest shots. ". . . the wildest stroke of luck," as Stiles puts it. Kirk's not a "sorcerer", just incredibly lucky -- for this, anyway. On the other hand, the Romulans had an incredibly lucky shot with their "nuclear device of some kind". Or is it standard procedure for starships to go through debris? Note also that it detonated only 100 m away. A nuclear explosion at 100 m and the Enterprise survives? Those are some shields! Hmmm. A couple of rounds of phaser shots and the phaser control circuit overloads. They must have been using aluminum wiring. And then after a few more rounds Spock has to work on the transfer coil again! What are these, bargain basement phasers? Why do the ships tilt when damaged? There's no up and down in deep space. I can see radio contact without video. Video takes *a_lot* more bandwidth. It's sort of like Morse code being able to work where audio can't due to noise or distance. What's with the "play dead" game? If the Romulans can pick up Spock accidentally turning on something on his dashboard, why can't they detect the ship while they're still turning everything off (except the gravity, of course)? The ships at this stage are "motionless". Motionless relative to what? so the motion sensors pick up only motion relative to the galaxy? How does that work? Why didn't Spock save Tomlinson? I hope it was because he was already dead. 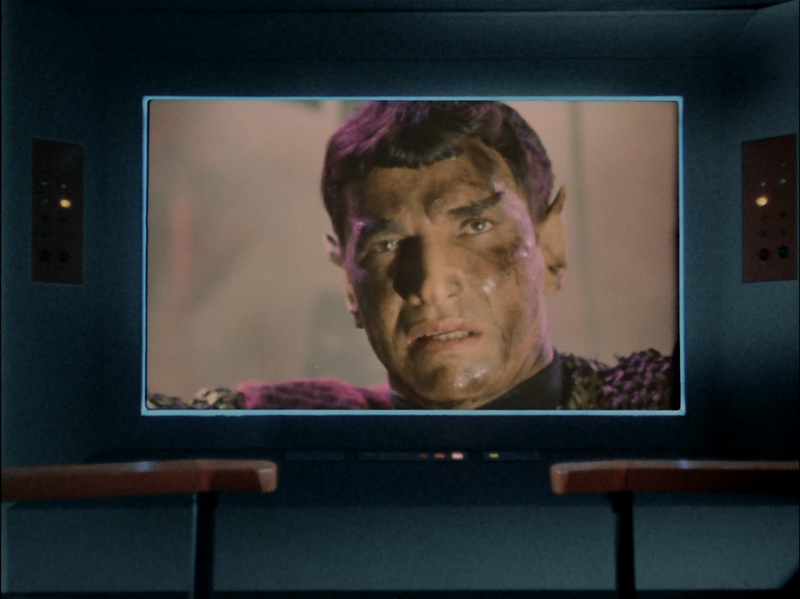 Spock often seems to care more about other sentient life forms in other episodes -- like the cavemen in "The Galileo Seven", and the Horta in "The Devil in the Dark" -- and even expressed regrets about destroying Nomad and shutting down the M5. I prefer to think that Tomlinson was dead by the time Spock got there. In fact, Stiles is still moving while Tomlinson is lying motionless. But do we need to wrap up the bigotry bit somehow, I suppose. Seat belts, lol, a consistent oversight in all Trek incarnations. Second only to lack of the need for toilets (ST5 exceptionish noted). I like to think the addition of a visual signal on the Romulan ship that can be tapped into would be due to Tal Shiar (Yes, cannon does establishes it predates the Federation) wanting to make it easy to spy on their soldiers. Its there unbeknownst to the Romulan captain and crew, and made easy to use for the Tal Shiar (and unfortunately and unforeseen of them, easy for the Federation to use also). The submarine parallels and the logic of similarity between space and undersea vessels were obvious to me the first time I saw this episode. The similarity between sea-surface and space vessels is in language only, similarities are comparatively few. In fact, in ST2:ROK, Khan's mistaken thinking on this very point is fatal. ‘10’. It feels like a submarine story because it was adapted from one. This is one of the few episodes which takes a more technical approach to creating drama by way of the interplay of balanced (but asymmetrical) ship systems and commands. This episode also stands out for creating its dramatic tension almost exclusively from the scientific-technical elements inherent to the show’s premise. Too often Star Trek relied on some cheap gimmick, such as Godlike powers or the latest group of clowns to take over the ship, to eliminate some of the technical premises of the Star Trek world. This one stands out, along with one like the Cloud Minders, as taking special effort to avoid that narrative clique. It is also a highlight showing why episodes including the Klingons or Romulans seemed to have a ‘natural’ bump in quality..
1. maybe this camera is not actually on the asteroid but was orbiting it. That would certainly be practical and make a whole lot of sense. 3. maybe the initial explosion was not nuclear. 4. i never heard any character say that they were not near a star. 5. im sure 200 years from now they can build quite advanced sensors that could fit on a ship. hardly a problem that they couldnt build one now. 6. great response to this question from an above poster about the tal shiar. 7. Spock covers this problem when describing the power cost of the cloaking device. 8. you answered this question yourself. 12. the ship tilts because it just got hit by a nuclear weapon (lots of force). that is obvious, and i dont understand your objection. any loss of balance or changing perspective for the actual people can be explained by gravity plating not functioning correctly...... when hit with a frickin nuclear weapon. 13. the play dead game is a very real thing for submarine battles. Why cant the same be true in this situation? 14. motionless relative to each other. come on, that was easy, you didnt try very hard on that problem. perfect example of fishing for problems where they dont exist. 15. you answered this yourself. "I will show you how pretty much everyone of your "problems" isnt one:"
First of all, there's no need to be hostile. Second, you need to fix your Shift keys. Third, your lack of quoting makes parts of your post hard to follow. Even a few snippets of quoting here and there or a few contextual clues, which would have taken very little effort on your part, would have helped. OK, here's my rebuttal. 1. maybe this camera is not actually on the asteroid but was orbiting it. That would certainly be practical and make a whole lot of sense. 2. same as 1"
The fireball is coming straight at the camera. It fills the frame, meaning your satellite camera is directly between the ship and the asteroid, which means it would have been destroyed. No, I don't believe your satellite camera could somehow survive being enveloped by the plasma ball. Even if it did, I don't see how it could survive an asteroid underneath it being pulverized. And there _are_ problems with the idea of an orbiting camera. If the camera is in orbit around the asteroid, how does it get a radio signal through a mile of almost solid iron? Iron is conductive, which makes matters even worse! ELF is needed just to get to our submarines here on Earth. There's precious little bandwidth with ELF, so forget video. And iron is eight times as dense as water. A long-term stable orbit might well be difficult to achieve: Asteroids are very small, so their gravitational fields are very weak. They are irregular in shape, meaning the field will not be spherically symmetric. Furthermore, they are rotating, meaning the gravitational field will vary in time. Another problem: We see the bright flashing from the control room for too long. The camera there would probably have been destroyed too soon to see most, if any, of that. 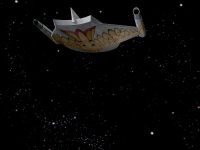 Yet another problem: When the Romulan ship first becomes visible, the stars are not moving. When it vanishes, the stars are moving as if the Bird of Prey were moving backwards at warp speed (and on impulse power!). Did your satellite camera, showing us this, assuming it somehow survived, also go into warp drive to follow the ship? 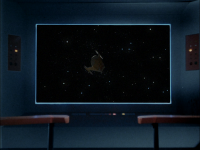 Strangely, when the Romulan ship disappears, there is no break in the view of the moving stars. It's as if the shot of the fading ship were superimposed on the star field the Enterprise was flying through at the time, which also makes no sense. Maybe the Romulans just like to make some thermite fireworks before self-destruction. It was a rather long initial "explosion" -- about 8 seconds, in fact. And the picture fades out with the bridge still intact, so the nuke couldn't have gone off even then. While it does take an initial explosion to set off a nuke, it can't take 8 seconds. Actually, it was just a lot of flashing light and noise for effect. Some explosion. And why the fade-out? Don't you think if a nuke destroyed the ship the broadcast would just abruptly end? Why would anyone even expect a fade-out instead? No one said the comet was not in the Andromeda galaxy, either. But I think it's a safe bet that it wasn't. The same goes for the comet not being near a star. Notice that there are stars zooming by when we see the comet. This would not happen if the comet were near a star. Besides, why would Spock mention just a comet if they were heading through a solar system? The comet would be only a very tiny part of it. And its sun would light up the Bird of Prey, causing the cloaking device to tax the ship's power source even more, which is clearly not in the Romulans' interest. And comets don't come in flashing colors. In fact, the earth passed right through the tail of Halley's Comet in 1910 and no one saw anything from that. A comet's tail is quite tenuous. See http://www.nytimes.com/interactive/2014/11/12/science/space/rosetta-philae-comet-landing.html?ref=space for another example. A totally unsupported statement. We're talking about seeing an extremely dark, relatively extremely tiny ship at an incredibly enormous distance. We can _barely_ measure the sizes of nearby humongous stars. One of those stars is Betelgeuse. It angular diameter is roughly 0.055" (with a large uncertainty), which is approx. 3x10^-7 radians. If our Bird of Prey is 100 m wide and 100,000,000 km away, its angular size would be 10^-9 radians, which is a factor of 300 smaller. Now you're going to tell me that we could measure the size of something almost totally dark with an angular size about 1/300th of an incredibly bright star Betelgeuse, and which could well be edge-on? I don't think so. And simply being able to detect it wouldn't be enough. You have to find it and identify it. That's hard. Finding Betelgeuse is easy. It's the bright red star in Orion. You can see it with the naked eye. You already know where to point your detector. That gives you an enormous head start. Yeah, you've got those motion sensors. Still. I'm amazed if even those work at "extreme range." Consider that a 100 watt light bulb emits about 10^15 photons / cm^2 / second at a distance of 1 meter (a quick fact from my _Classical Electrodynamics_ textbook by Jackson.). Let's say your detector is 10m x 10m (1000cm x 1000cm). That gives you 10^21 / d^2 photons/second in your detector, where d is the distance in meters. So at 100,000,000 km (less than the distance from the Sun to the Earth), you get 10^21/[(10^11)^2] = 0.1 photons per second. Then you have to include the inefficiency of your detector and be able able to pick out those 0.1 or fewer photons / second from those from the background stars. Add to that the noise you'll get, and you'll find it rather impossible to detect a dark extremely distant ship. Add to that you don't even know which way to point your detector. And you're telling me we can not only detect, but also _find_ and _identify_ a tiny at such a distance? I don't think so. You also have resolution problems due to the unavoidable diffraction of light. There are certain limits imposed by physical laws that you simply cannot get around. Granted, the ship isn't a 100 W bulb, but this is close enough to see how hard this is. There are no explicit distances given but we do have Sulu saying, "Something visual ahead, Captain, at extreme range." So I think 100,000,000 km is on the short side if anything. Even at 1,000,000 km, you get only 1000 photons per second. Maybe, just maybe there'll be a way to accomplish this in the future, but if so it probably would take time to collect enough photons. But I hope you can now appreciate just how hard a problem it is. I think it highly unlikely that it will ever be practicable. The Tal Shiar is a ridiculous explanation. Commenter zerothis, whom you referenced for this, says, "I like to think the addition of a visual signal on the Romulan ship that can be tapped into would be due to Tal Shiar (Yes, cannon [sic] does establishes it predates the Federation) wanting to make it easy to spy on their soldiers. Its there unbeknownst to the Romulan captain and crew, and made easy to use for the Tal Shiar (and unfortunately and unforeseen of them, easy for the Federation to use also)." OK, so you're saying that the Federation somehow knows about this Tal Shiar even though the Romulans in their own ship don't know about it? Wouldn't Romulan ships detect the Tal Shiar beams from each other? If the Federation can, then certainly other Romulan ships can. I think they'd catch on at some point. And it's kind of a dumb thing to do being that, as you yourself said, the enemy can easily pick up the video too. There's also the rule of silence that Decius broke. Tal Shiar would break that, too. 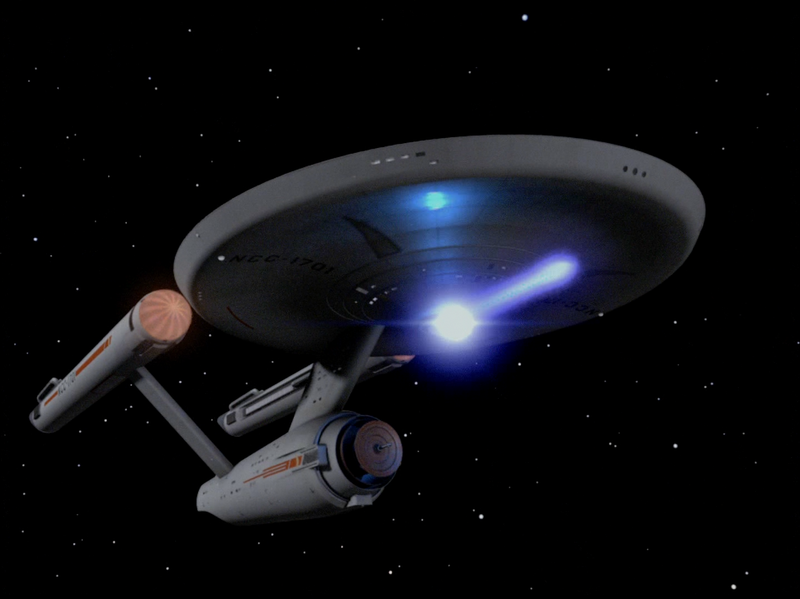 And as the transmission would be aimed the other way, it's amazing the Enterprise could detect any signal at all. There is nothing in the episode to indicate that there is such a thing. In fact, the reason given was that Decius sent a signal to the Praetor. And it's quite clear from Uhura and Spock that they're getting the video from and because of the communication by Decius, not by any separate signal from a 24/7 security camera. And they lost the picture when the transmission ended. Why would Decius send a live video feed from the bridge? You could say that the Tal Shiar sneaked it in. Fine, but that takes a lot more bandwidth than a glorious message, so it wouldn't work, on top of the other problems given above. The communication was in code. Uhura made a tape of it so that Spock could decode it _later_. And the video portion certainly wasn't in some known format like NSTC or PAL or whatever they use on the Enterprise. But you would have him getting and _decoding_ a secret video in an unknown format in real time (and before analyzing the tape to decode it!) from a signal aimed away from them, only seconds after the beginning of the transmission, and somehow even know that there was video in the message in the first place?! "I have a fix on it, Captain. I believe I can lock on it, get a picture of their Bridge." I don't think so. Tal Shiar may pre-date the Federation, but it was made up _after_ TOS. That's a weakness at best. Are you talking about having to turn off the cloaking device to fire the plasma ball weapon? I was asking about why the Romulans don't have _phasers_. They could have at least tried to steer away from the plasma ball. They have done evasive maneuvers in other episodes. If the ships are heavily damaged they'd be unlikely to be able to fire their weapons at all. Even so, 35 seconds is a long time. And what good are the cloaking device and the plasma weapon if the ship is so vulnerable to mere phasers during that time interval? Don't they have any decent shields? As for "very low on power": If your car is low on gas, you can still accelerate at the same rate. Only if you're running on batteries would this be a problem. Once you make your own ship visible, it is a no-brainer to fire as soon as possible. As for lucky shots, we're talking lotto-jackpot lucky here. (Remember when Stiles says, "the wildest stroke of luck"?) When they lose the Romulans in the comet, Kirk fires the weapons and somehow hits their ship, _even though they have no clue as to which way to fire_! Kirk even says, "Now, fire blind." All of the phaser shots are lotto-jackpot lucky except the last barrage when the Romulan ship is visible. Hell, if they can hit the ship even with its cloaking device on and firing blind, what good is this amazing device? Unlucky? As in the phasers crapping out three times in the same episode?! 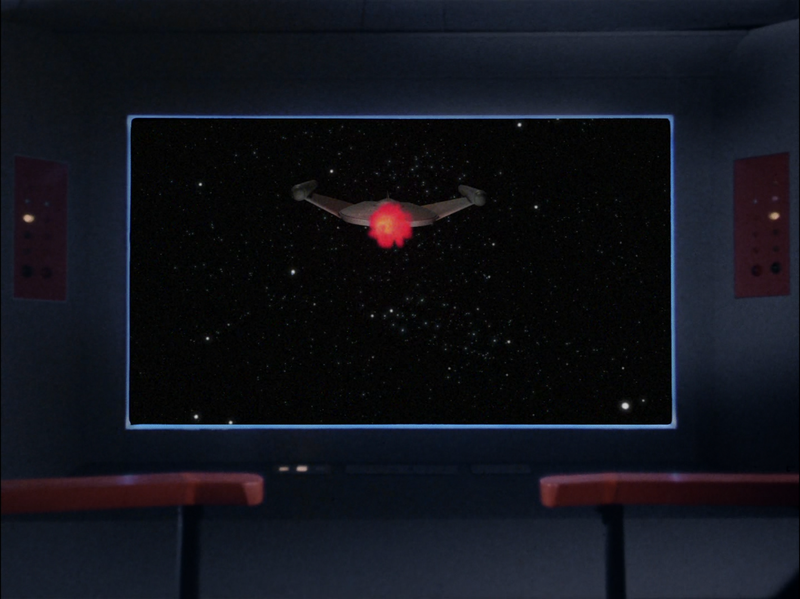 So you're saying they can get a video of their bridge, see extremely dark extremely tiny ships at extreme distances, make lotto-jackpot-lucky hits repeatedly with phasers that have a range longer than that of the plasma ball chasing the Enterprise for more than two minutes, and aim them from that same distance (! ), yet these same phasers somehow crap out not just once, but three separate times? And no backup phasers? You can't have it both ways. You seem to have totally misunderstood what I was asking. I said: "Why do the ships tilt when damaged? There's no up and down in deep space." There is no up and down in deep space. Tilting then becomes a matter of "relative to what? ", not an indication of ship damage. It's clear that the "tilting" was meant to show damage. And having people falling across the bridge was meant to show that the ship has been tilted. The problem is: how do you square this with the fact that there is no up and down in space? It is very difficult or even impossible for most of us, if not all of us (aside from astronauts), to imagine what it's like to be in an environment without an up direction. (In fact, I recall one astronaut saying that to avoid disorientation, they (or he, at least) have to mentally and forcibly choose an arbitrary direction to be up.) This follows from the fact that we evolved, grow up, and live in an environment with an up direction, which is determined by the Earth's gravitational field. The up direction, along with the gravity that determines it, is of enormous consequence in our lives. That's probably another reason it's so hard to shake off. And this is why tilting and falling across the bridge are so problematic. It presumes an external up direction. But an up direction comes from gravity, and there is no external gravity here, hence no reference for absolute tilting or falling. BTW, notice that Kirk and Uhura fall "uphill" while everyone else falls "downhill". The only thing that saves this is that in the "tilted" position, they are not aimed at the enemy. I'll grant you that. So it is difficult to portray something more realistic. Also, notice that the debris in the Romulan bridge falls straight (perpendicular) to the floor, contrary to what you would get if the ship really "tilted," but exactly what you would expect from just the camera tilting. But at least the Romulans all fall "downhill", and the actors' timing is truly remarkable! I don't know enough about the gravity plating to comment on how it might malfunction. But I think your explanation is rather unlikely, and the mere existence or even possibility of such plates is very unlikely. Also, there is, AFAIK, no explanation in TOS as to how they work or that they even exist. Back to the ships: The Enterprise would have been rotating after the nuke went off. It wouldn't just rotate a little and then stop. Besides, based on the apparent tilt, the bridge crew didn't even "fall" in the right direction. Another problem is that at the end of the episode the Romulan ship appears to be rotating in a way that violates the law of conservation of angular momentum. Well hell, why doesn't the Enterprise just move a little then? And it's ridiculous for other reasons. The Enterprise often "stops" in space. It seems from the series taken in totality that nothing can move without being actively propelled. Or needing continuous power just to stay in orbit. Orbits decaying in hours or less is ridiculous. And it's only once that I can recall that "coasting" was a real thing. It's as if Newton's laws of motion didn't exist. And if they have motion sensors, why not also radar? Actually, if the motion sensors work by the Doppler effect, zero relative motion would also be detectable, which basically would be the equivalent of radar. In this episode: "Captain's log - supplemental. Now motionless for . . ." Relative to what? Well, approximately to the galaxy, I'd presume. How would you measure that? BTW, the galaxy itself is moving! It seems clear to me that the writers for TOS had no conception of relativity theory, and were assuming the world of absolute time and space given in Newtonian physics (but not his laws of motion) -- and I believe even Newton realized there was a problem with that, in particular, finding which inertial reference frame is the one that is truly "at rest." Relativity solved that problem by determining that there is no such preferred inertial reference frame and more. I believe this is in reference to my comment: "Why didn't Spock save Tomlinson?" I still think it's a point well worth some discussion, as there is too much ambiguity with it. And especially since Spock seems so concerned about other life forms (and even entities like M5, Nomad, Landru, but then only to exploit or study) and so little about humans if they're not useful for something he deems important enough. I still love Star Trek TOS, even with all its problems. Lots of problems with this episode but it sure was fun to watch as a kid! Like a few others, I have a problem with no side having seen the other notion. I can't imagine any treaty being signed without some kind of face-to-face meeting between belligerents. Further, the war took place before warp drive which means humans have not yet met Vulcans despite what Spock says. Further, he says that there was no ship to ship visual contact! How does Stiles know that Romulan vessels are painted like a big bird of prey? Even if warp drive had been discovered and Vulcans and humans knew each other, how would a Romulan know this, or even consider it a good idea to keep their little secret? Why would they know their roots, but Vulcans not? None of this makes sense at all to me despite the Enterprise series' explanations, which I've not seen. Stiles should have been clapped in irons and run out of the service for his open disrespect and bigotry to a senior officer!!! I don't know if this was mentioned anywhere above ...probably... but, the Enterprise looks to be firing Photon Torpedoes and not Phasers. A glaring error and they should have fixed it with the remaster. As Spock so often says throughout the series, "We were most fortunate!" or "Random chance seems to have worked in our favor!" FYI, the episode is based on the excellent movie, "The Enemy Below" which can be seen freely on YouTube. I highly recommend it! !